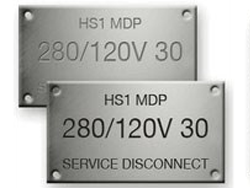 Our precision industrial engraving services are available for data plates and more. We ensure each letter is marked legibly for easy reading and guarantee a fast turn-around time. From stainless steel plates to vinyl banners, we are your direct source for all of your engraving and signage needs. Available for any type of surface and size, we get the job done right the first time. Let us help you with all of your industrial engraving needs. 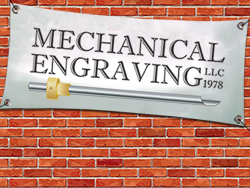 Mechanical Engraving LLC in Bear, Delaware, provides custom engraving of data plates, mechanical room identification, and industrial signs for mechanical contractors, utility companies, tank companies, refineries, chemical plants etc. We know that engraved information for industrial application must be permanent and remain legible, regardless of the environmental conditions, so we focus on quality to ensure readability. All of our products are made to your exact specifications, including size, design, quantity, and material. 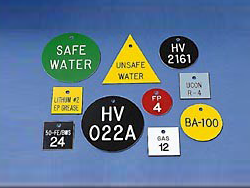 Each plate is priced according to material, plate size, character height, and character count. Logos are price by complexity, computer editing is an additional charge. Our family-owned-and-operated business was established in 1978 by Bob Ashby formerly with Local 420 Pipe fitters Union. 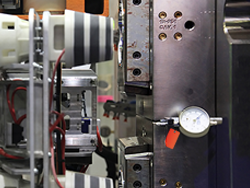 With more than 35 years of experience, our company has expanded over the years due to new technology. We use state-of-the-art equipment as well as the most current methods and techniques for industrial engraving. • Skanska USA Civil NE, Inc.